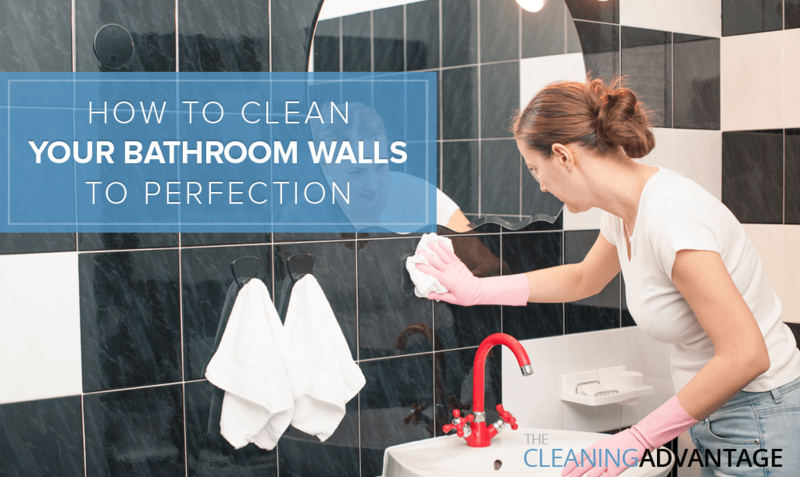 If you’ve been leaving out your tiled walls every time you clean up the bathroom, you’re not the only one. Many homeowners tend to neglect bathroom walls because they are either unaware of how to go about cleaning them, or simply do not understand the importance of keeping the home clean and sanitary! The truth is, like your bathroom floors, tiled walls get grimy and covered in bacteria due to splashes of soap scum when you’re showering. What’s more, the humidity levels of the bathroom encourage mold and bacteria build-up. In fact, if you take a close look, you’ll see a grayish film covering areas of your tiles which is a mixture of water stains, soap scum, and body oils. If you think that sounds disgusting, that’s because it is! Put on some rubber gloves and keep a pair of goggles ready to use for when you have to start the cleaning process. Select any bleach-based bathroom cleaner and mixed it with equal parts water in a spray bottle. Put on the goggles, step into your bathroom and one by one, start spritzing the walls generously. If you can’t wet the top sections of the walls properly, bring in a ladder and spray the tops and corners. You’ll need to spray the walls enough until they are dripping. Once you’ve covered the walls in this solution, keep the window and door closed and time if for about 3-4 hours. With this process, the longer you wait, the more effective the results; hence, we spray the walls and keep it overnight. However, if you are unable to do this, a couple of hours will do, too. When the time’s up, put your gloves and goggles back on and start splashing the walls to remove the cleaner. By now, the bleach would have removed 90% of dirt, grime, and stains! But for the 10% that isn’t so squeaky clean, the following steps will take care of it. In a bucket, make a sudsy solution of any bathroom cleaner or liquid detergent mixed with water. Now, dip a handheld brush (a large one so that you get more cleaning done with minimal effort) into the bucket and start cleaning those not-so-clean areas. If you’d like, you could also go over the rest of the wall for a deep cleanse. Lastly, rinse out your walls thoroughly with water to ensure that all the bleach and soapiness has been removed. If there is any trace of cleaner left on the wall, it will appear in the form of a grayish/whitish stain which ruins the beauty of clean, gleaming tiles. Once you’re done, leave the bathroom window and door open for the tiles to air dry.